As promised in the last post, here is the suggested order for your pedals, and a little clean up of miscellaneous subjects associated with pedals and pedal boards in general. First: because wahs, auto wahs and other dynamically controlled effects respond to attack, you’ll want them up front so they won’t be affected by buffers or compressors. Second: Here’s where your compressor goes. Because they tend to amplify the noise of the effects in front of them, you want them as close to the front of the signal chain as possible. Third: Distortions and overdrives go next. Now, I know this is against what I’ve already said about your distortion pedals, but this is the recommended order from guys like Pete Cornish (the guy who invented pedal boards back in the ’70’s), Dave Friedman (Rack Systems), Bob Bradshaw (Custom Audio Electronics), Michael Piera (Analog Man) and James Santiago (Voodoo Lab), some of the best sources in the industry. Fourth: Put your modulation effects here. Phasers, flangers, chorus and tremolo do well here because they interact well with the output of distortion pedals. Sixth: This is where delay and reverb come in. You’ll want delay pedals before reverb. The delay goes here so that any existing signal in the delay will naturally decay when you cut the volume down and you won’t cut decaying tails off. They also need to be after distortion pedals because an unnatural jump in levels can occur if they are before distortion. 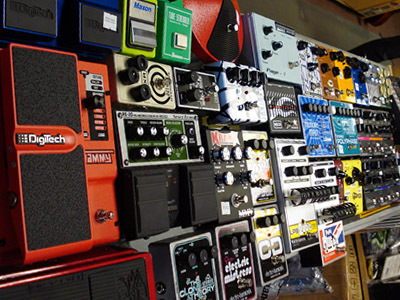 That is the “recommended” order for your pedal board. Remember that last time, I said you could put some effects into your effects loop of your amp. Adhering to the order, your delays and reverb can go there and you have control of the overall volume out of your board with your volume pedal. None of these recommendations are hard and fast rules. 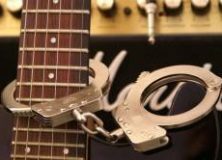 That’s one of the problems with guitar playing… there are no rules. That’s also one of the great things about it! There are as many guitarists violating these “rules” as there are guys who stick to them. Every pedal will behave a little differently depending on what other pedals are in front of or behind it. Also, your Fuzz Face won’t be exactly the same as your buddy’s. That’s the nature of the beast. Some of the world’s best tones were discovered by swapping pedals around so they interact more with each other, sometimes in very strange ways, to come up with something new. Don’t be afraid to experiment until you find the sound that’s right for you. Everybody I know, including me, uses soldered end cables – period. George L’s solderless pedal board cable system is convenient but can loosen and cause all sorts of problems. Premade soldered cables for pedal boards come in almost any length you’ll need and, if you can solder, buy your own Mogami or Belden cable and some good quality plugs and make your own. It isn’t that hard and you can make all the custom lengths you need. The bottom line is, you should buy the best cables you can afford… within reason. Paying $100 for a ten foot cable is overkill and you won’t hear the difference anyway. Conversely, scrimping on cables will affect your sound to the extent that you can hear it. I once grabbed a cable out of my gig bag and plugged in. I sounded terrible! You could hear every fluorescent light in the place humming through my amp. I spent several minutes trying to figure out what was wrong before I noticed that I had plugged in a cord labeled “speaker cabs only.” Cheap cable will eventually give you the same results. Another rule of thumb here is to keep your cables as short as possible. If a long cord is needed, and it will be sometime, use high quality, low capacitance cords in that instance. Also, you want to protect your cords from foot traffic and anything else that might roll over them on stage. Check out my “Cable Snake” how-to for a cheap way to keep your cables organized and protected. Here’s a quick test to check out the condition of your cords: While plugged in, roll your cords lightly under your foot. Don’t stand on them but use just enough pressure to get them to roll back and forth. Do you hear any crackling or static from your amp as you do that? If not, your cables are okay. If you do, trash the offender (maybe cut the ends off if they’re in good shape). What about Loop switchers? Loop switchers are some of the best devices to come down the pike for the working guitarist. If you routinely have to do the River Dance to change over your effects, a loop switcher may be just the ticket for you. There are several on the market ranging from simple and affordable to Alex Lifeson complicated, with the associated cost. Your needs will determine what type is best for you. 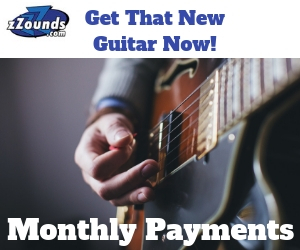 Check out Pedal-Racks, Radial Engineering, The Gig Rig and Voodoo Lab for some good and affordable options. Is battery power better than using a supply? Yes and no. Batteries can’t induce hum or noise and are a steady, clean power source. As soon as you plug your cord into the input of your pedal, the battery is turned on, and stays on until you unplug that cord. This is a real pain for pedals tied to a pedal board with short pedal-to-pedal cords where there just isn’t space to unplug without pulling the pedal off the board. Battery life is short in that instance. The power supply eliminates that problem altogether by removing the batteries totally from the pedal and replacing it with a regulated 9 volt DC source that plugs in to a wall outlet. No need to play with the input cord. 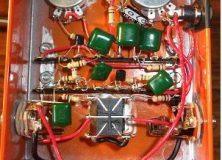 Power supplies can be a source of ground loops and noise if not installed correctly and some older pedals require modification to work well with them but, their popularity with guitarists and good quality products from the manufacturers have made them standard equipment for most pedal boards. What about multi-effect pedals? Personally, I like them, especially the ones that allow programming your own sounds and allow recall of your sounds in combination. They are also handy for small gigs or practice when a simple setup is all you need. Everybody makes them, ranging from simple to $500 worth of complication. The only disadvantage I see with them really is failure. If they fail, you lose everything, not just one effect. Most of the pros don’t use them, preferring their multi effects to be in a rack, if they use them at all. Joe Bonamassa uses only stock pedals available at any Guitar Center, just in case he has a failure on the road. That’s from a guy who could afford any custom multi-effects setup he wants. He may be right. What about those pedals with their own power supply or an AC plug? Usually (and that means what it says), pedals that come with their own supply will either require an odd voltage or draw enough current that they may overload your board supply. 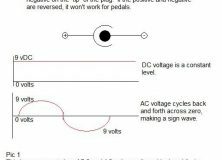 Some circuits just need strange voltages. Don’t be concerned about using them with your setup. Do be careful of a ground loop with your existing supply, though. (Experiment for the best sound.) If the pedal has its own AC plug, you’ll need AC power to the board but you have that for your supply already. There should be no problem as long as you are using polarized or 3-prong plugs. Once again, beware of creating a noise problem. Well, there you have the thinking of a few experts on the subject of pedal order and other related topics. There are as many opinions as there are people to give them. Take them all with a grain of salt and experiment. You can’t hurt a pedal by putting it in the wrong order… wait… there is no wrong order! For some really good info about pedals and cabling, check out pedalsnake.com.